While technically the museum had its beginnings as the Museum of Non-Objective Painting in 1939, the official Solomon R. Guggenheim opened in 1959, and contains one of the most impressive and comprehensive collections of Modern art, spanning mid-19th-century Realism to Postmodern sculpture and installation. 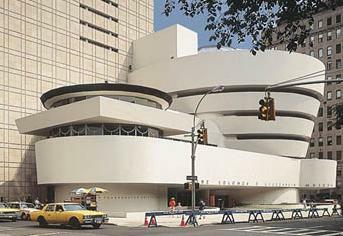 The Solomon R. Guggenheim Museum is now one of the wealthiest museums devoted to Modern art in the world. Its parent organization, the Guggenheim Foundation, is today a global network of museums that includes world-class facilities in Berlin and Venice. Born in Philadelphia, PA in 1861, Solomon Robert Guggenheim was the son of Meyer Guggenheim, a Swiss-born businessman who made his family fortune in mining and smelting, and his wife Barbara Guggenheim. Solomon had three brothers, including Benjamin Guggenheim, who was the father of Peggy Guggenheim, who owned and ran the Art of This Century Gallery. 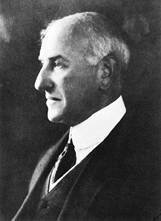 In 1919 Solomon retired from the family mining business and from his Yukon Gold Company in Alaska (which he founded), and in 1937 started the Solomon R. Guggenheim Foundation, a non-profit corporation dealing in philanthropy and the arts. At the museum's opening, visitors viewed paintings by Kandinsky, Rudolf Bauer, Alice Mason, Otto Nebel, and some by Rebay herself. Most of the works were part of Solomon Guggenheim's personal collection, which he had been amassing for years. Both Rebay and Mischenheim had elected to hang all of the paintings low to the ground and mounted on walls covered in thick drapery, a rather unorthodox choice for its time. A sound system was also installed, so that visitors could listen to Bach and Chopin while they viewed striking new works of art. As Guggenheim's art collection grew, so did the need for a larger location for the Museum of Non-Objective Painting. 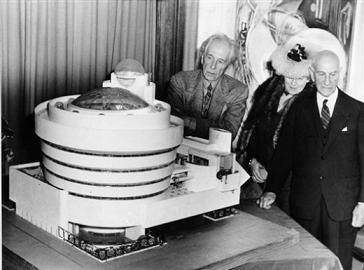 In 1943 Hilla Rebay commissioned the notoriously stubborn but brilliant American architect, Frank Lloyd Wright, to construct a permanent home for Guggenheim's museum. Rebay penned a now-famous letter to Wright, dated June 1, 1943, which read, "I want a temple of spirit, a monument!" The choice of Wright was considered risky at the time, since the architect famously disliked urban settings. Altogether, Wright composed six or seven different comprehensive plans for the new museum, and a total of 749 drawings for the interior and exterior design. With World War II still being waged overseas, the cost of building materials continued to rise, causing frequent delays in planning the construction of the new museum. In 1949 Solomon R. Guggenheim passed away, resulting in even further delays. 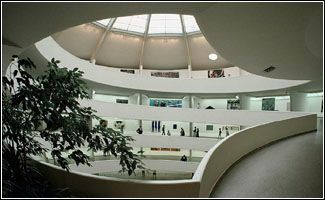 Shortly after his death, the museum's board of directors agreed to change the name of the Museum of Non-Objective Painting to the Solomon R. Guggenheim Museum. In 1951, Solomon's son Harry, who had taken over as chairman of the board of directors, forced Rebay to step down as Museum Director (Solomon was apparently the only Guggenheim who held Rebay in any favor). In 1952 former MoMA curator James Johnson Sweeney was appointed as director of the new Guggenheim Museum, a position he would hold until 1960. Construction of the actual building, however, did not begin until 1956. Once Wright's plans became public knowledge via New York newspapers and other media, many artists and critics reacted with considerable disfavor; many artists collaborated on a letter addressed to Sweeney, expressing that Wright's plans for a spiral walkway and curvilinear slope were "not suitable for a sympathetic display of painting and sculpture." The letter was signed by such notable figures as Adolph Gottlieb, Willem de Kooning, Franz Kline, Robert Motherwell and Philip Guston. Sweeney himself, incidentally, was known to have had a rather antagonistic relationship with Wright, and the two often clashed over the architect's plans; it is possible Sweeney was sympathetic to the concerns of the aggrieved artists. In 1948 the Guggenheim Foundation purchased the estate of the late New York art dealer Karl Nierendorf, whose collection mostly specialized in German Surrealism and Expressionism. The foundation counted among its collection an additional 730 artworks, including paintings by Klee, Chagall and Miró. Once Sweeney had taken over as Museum Director, he rejected Hilla Rebay's basic principles of excluding all non-painting artworks from the foundation's collection, as well as any pre-20th-century art. Beginning in 1953, with the blessing of the board of directors, Sweeney began purchasing works by sculptors such as Calder, Smith and Giacometti; and in a clear affront to his predecessor's wishes, Sweeney acquired Cézanne's Man with Crossed Arms (c. 1889). Today, both sculpture and the 19th-century paintings of the Impressionists and Post-Impressionists play a key role in the Guggenheim Museum's permanent collection. On October 21, 1959, the Solomon R. Guggenheim Museum opened its doors on 1071 5th Ave. in Manhattan's Upper East Side. Sadly, Frank Lloyd Wright passed away in April of that year, so he never witnessed the completion of his final project. The public's response to the museum was largely favorable despite early misgivings; the architecture was considered risky (and to some extent still is today), but overall Wright's design was, and still is, admired for being highly personal and inviting. 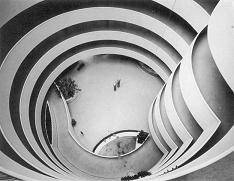 New York Times art critic John Canaday, however, unequivocally denounced the new Guggenheim building; in his opening day review, entitled "Wright Versus Painting," Canaday lambasted the late architect for infusing his design with "the giddiness of the fun house in amusement parks .. If he had deliberately designed an interior to annihilate painting as an expressive art, he could not have done much better." Canaday, already infamous amongst many Abstract Expressionists and other Modern artists for denouncing Abstract Expressionism in general, was unforgiving of Wright's personal vision of a modern-day cathedral that invited visitors to view paintings in natural light. In 1961 Sweeney was replaced by the new museum director, Thomas M. Messer. In 1963 Messner helped the museum to acquire several significant Modern works by Gauguin, Manet, Van Gogh and an astonishing 32 works by Picasso. Then in 1969, following a museum exhibition of the Peggy Guggenheim Collection, Messer convinced Solomon's niece Peggy, now residing in Venice along with her substantial collection of Modern art, to bestow her entire collection to the Guggenheim Museum upon her death. When Peggy passed away in 1978, the Guggenheim Foundation acquired her entire collection of some 300 Cubist, Surrealist and Abstract Expressionist works, including essential works of art by Duchamp, Magritte, Ernst and Pollock. 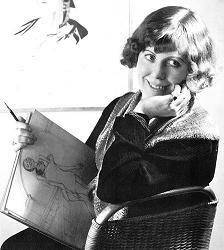 The foundation had also acquired Peggy's Palazzo Venier dei Leoni on Venice's Grand Canal, where she lived and regularly exhibited works from her collection. In 1985, after considerable renovations to the Palazzo, the Guggenheim Foundation opened its second museum, the Peggy Guggenheim Collection in Venice. The 1990s witnessed the Guggenheim Foundation expand its overall collection by nearly fifty percent. In 1991 the Solomon R. Guggenheim Museum's newest director, Thomas Krens (appointed in 1988), was instrumental in acquiring the Panza Collection, which included several Minimalist works of sculpture and painting by such artists as Carl Andre, Dan Flavin, Donald Judd and Robert Mangold. With this type of growth, new venues were needed. Krens also oversaw the Guggenheim Foundation's venture to expand its international presence, and in 1991, the city of Bilbao in northern Spain was selected as the site for the foundation's third museum. Recruiting the services of American architect Frank Gehry to design the new museum, the Guggenheim Museum Bilbao opened on October 19, 1997. Situated on the scenic Bay of Biscay, and constructed out of titanium, glass and limestone, Gehry's building received near-unanimous praise from critics, including the architect Philip Johnson, who called it "the greatest building of our time." In 1992, coinciding with the completion of a 3-year-long restoration of the main Guggenheim building, the foundation opened the Guggenheim SoHo in downtown Manhattan. Housed in a relatively small building designed by architect Arata Isozaki, the SoHo branch showcased exhibitions by Andy Warhol, Marc Chagall and Max Beckmann, among others. Only a few years after opening the multi-storied satellite museum, the ground-floor gallery space was taken over by retail stores, and other floors were housing nothing at all. The Guggenheim SoHo finally closed in 2002 and was widely considered a failed venture for the foundation. The Guggenheim Foundation has continued in recent years to expand its international scope even further, opening the Deutsche Guggenheim in Berlin, Germany in 1997, and will soon be opening its largest museum to date, the Frank Gehry-designed Abu Dhabi Guggenheim in the United Arab Emirates. By 2011 the foundation has plans to open The Vilnius Guggenheim Hermitage Museum in Lithuania, and The Guggenheim Guadalajara in Mexico. While the Solomon R. Guggenheim Museum as an institution owes a great deal to the legacy of Hilla von Rebay and her enthusiasm for abstract painting, the museum itself has far surpassed its original intent. Frank Lloyd Wright's building has become synonymous with Modern architecture and is universally recognized as such. Though considered a somewhat unorthodox design for a museum, many architects have taken more than a few pointers from Frank Lloyd Wright's approach, and have designed art museums that are constructed less like traditional gallery spaces and more like asymmetric, quasi-organic growths springing naturally from the earth. Frank Lloyd Wright's design for the museum survives as a cultural icon of avant-garde architecture. "Entering into the spirit of this interior, you will discover the best possible atmosphere in which to show fine paintings or listen to music. It is this atmosphere that seems to me most lacking in our art galleries, museums, music halls and theaters." "Wright's building made it socially and culturally acceptable for an architect to design a highly expressive, intensely personal museum. In this sense almost every museum of our time is a child of the Guggenheim."